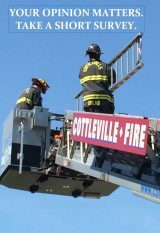 COTTLEVILLE FIREFIGHTERS OUTREACH IS LOOKING FOR OUR NEXT FIREFIGHTER FOR A DAY! work life of a firefighter. A routine day consists of performing exciting tasks with Cottleville Firefighters including: performing truck and equipment checks, wearing firefighting gear, using an SCBA, spraying water from firefighting appliances, climbing the tower ladder truck, touring the fire stations and riding on the firetruck. Aside from these tasks, our young firefighters are also treated to lunch with the crew, a personalized fire helmet and a certificate of achievement.